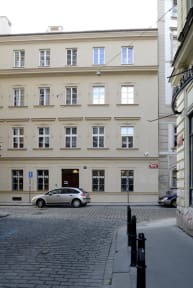 Safestay Prague, Praga, Czechy : Rezerwuj teraz! Safestay Prague is a bright, clean, warm and light-filled hostel located just five minutes from Charles Bridge. Many of our guests say they'd recommend this budget-friendly hostel, especially for their clean, spacious and ensuite facilities. We like that they're wheelchair accessible. Safestay is in a brand new refurbished building in the heart of the Prague The building is located in Ostrovní Street, a few steps away from National Theater and at barely 5 minutes walking from the Karlův Most (Charles Bridge) and 10 minutes walking from the main Square with the famous clock. The building has been renovated to reach Safestay quality standards. Wooden floors, granite staircases, modern bathrooms with colored tiles and double window panes to keep the building warm in winter. We’ve paid special attention to the lounge area. We wanted it to be cozy and comfortable; this is why we’ve built a huge sofa with a local manufacturer that will allow our clients to watch movies or sports events in a very comfortable way. There will also be a kitchen available for guests in case our clients feel so comfortable at our Hostel that don’t want to go out for lunch or dinner. Hostel was amazing, in the center, near to subway, nice stuff and clean room. Przyjemne i schludne miejsce w bardzo wygodnej lokalizacji.